Seems like we already have a few fans! I'm going to start re-watching Season 1 tonight. And am really looking forward to getting onto Season 2. 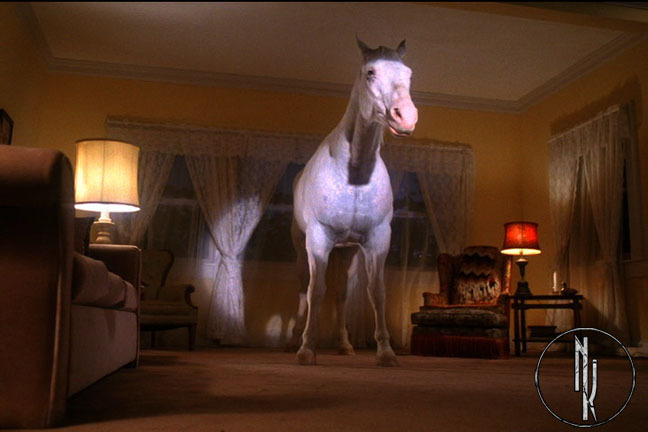 Twin Peaks freaked me out. This show is best when served with a slice of cherry pie and a cup of coffee. oh crap- he's staring right at me...take him down take him down!!! Screaming Laura Palmer was scarier than Bob. I know its supposed to be reminiscent of a Pink Floyd album cover (I think) but doesn't it also look similar to the Packard Mill too? One of the greatest shows of all time......very spooky....cool storyline,had a mixture of scifi and being a thriller,and the characters were just truly amazing!! I absolutely LOVED Twin Peaks! I really never understood the David Duchovny transvestite phase... but oh well. Nicole--I think you're going to love Season 2! There's one thing I could never figure out about the end of the Pilot episode. Do you know where Laura's mother is sleeping at the end, then there a quick cut to someone taking the necklace from the ground then cuts back to Laura's mother and she screams...? Nicole wrote: There's one thing I could never figure out about the end of the Pilot episode. That's what I thought too but it just seems too... Meh? I downloaded the alernative ending there (the extra 20 mins of footage)... should I bother watching it? Edit: Just quickly flicked through it... isn't the last scene (the one where Agent Cooper dreams of the red room with Laura and the little guy) in a later episode?? Nicole wrote: I downloaded the alernative ending there (the extra 20 mins of footage)... should I bother watching it? Nah, it's not necessary at all. I didn't think it was all that great either, but that's just me. Yeah. I think they reused it for Episode 3...at the end.